The Teledoorbell system lets you answer your door from any telephone in the house. Or if you prefer, turn on the built-in call forwarding feature and when someone rings your doorbell, your office phone or cellular phone will ring so you can answer the door from anywhere in the world! The Teledoorbell supports call waiting so you can answer the door when you're on the phone, and has a distinctive ring so you can differentiate between a regular phone call and door call. The Teledoorbell system supports up to 4 individual door stations and links them to your phone system so you can communicate with the door(s) from any phone in the house or outside if you enable the unit's call forwarding feature. Expand the system by adding any of the Teledoorbell video or audio only door stations. Video stations have built in cameras that can be connected to a central DVR, TV/monitor or modulated so they can be watched on an in-house TV channel. The Teledoorbell controller is compatible with all X series, S series and Elite series door stations including audio only and audio/video models. 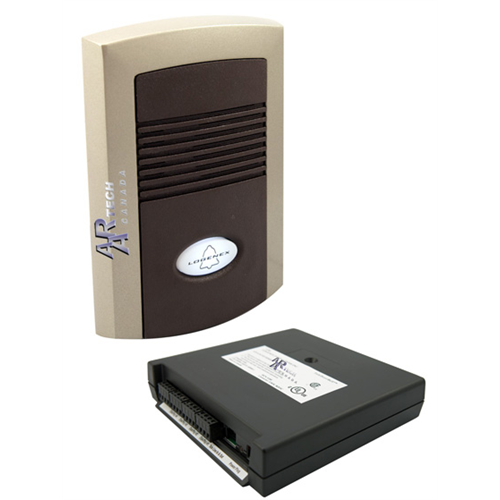 The Teledoorbell C404CR controller includes dry contact relays that can be operated by telephone/remote telephone and can be set for timer or latching mode, allowing them to control garage doors, remote security gate locks, electric door latches, alarm shunts, etc. The Teledoorbell allows the homeowner to call in remotely to communicate with the system, turn on/off call forwarding, control the relays or even perform some programming. Includes control unit, power supply telephone jack. Requires single CAT5 cable from each door station to main unit for audio/video/power. Long video runs require coax cable for video. If you do not have a house telephone system, a TBG-2 phone line simulator will be needed.